Just Blew It: Nike Favorability Drops By Double-Digits, No Boost In Key Demos; UPDATE: Insults Veterans? 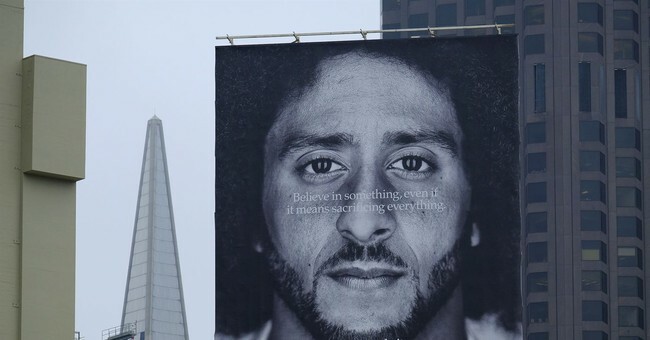 Well, in their infinite wisdom, Nike decided to make former NFL quarterback Colin Kaepernick the face of their Just Do It campaign. The ad has been released. The tagline is “Believe in something, even if it means sacrificing everything. #JustDoIt.” Kaepernick is a source of controversy, a vehicle for the left wing social justice activism that struck the NFL two years ago when he started to take a knee during the national anthem. There were a multitude of reasons but race relations and police brutality seem to be the top issues for why he and other players started this nonsense. No doubt the cause is worth a discussion. I totally disagree with their take, but it’s worthy of a discussion. All that good will went out the window as soon as you start trashing the flag. Kaepernick’s anti-police stance also drew a backlash. These players see their side getting attention. Everyone else sees them trashing the flag, our veterans, and those who have died in service to the country. It’s unpatriotic. It’s not appropriate—and the NFL knows it. When President Trump torched the players for kneeling, he won a solid cultural victory. Yes, we support his right to say and do these things, and we have the right to respond and say that he’s deplorable. This is a messy fight the cultural Left decided to wage, but it’s one in which they will lose again and again. Americans are patriotic. They love football. And they support law enforcement. Kaepernick is just another middle finger to conservative America. It’s fine. We’ll have this debate and school the liberals again if need be.